Hope House is a hospice, based in Oswestry in Shropshire, who provide respite care for terminally-ill children and support for their families. Due to the pressure for places in Hope House the staff were forced to introduce rationing for places. 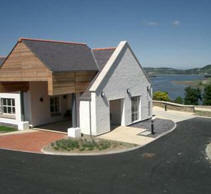 As a consequence, they embarked upon an ambitious project in October 2001 to build a second hospice in North Wales. This new hospice called Ty Gobaith was opened in July 2004 and the BWCF has assisted by granting £45,920 to pay for the construction and equipping of a multi-sensory room in the new building.